There are two kinds of fertilizer: chemical and organic. Both restore the same vital nutrients to the soil,, but in different ways. While organic fertilizer is made of naturally occurring organic materials such as composted manure, inorganic, or chemical, fertilizer is manufactured; its nutrients are synthesized in a factory using chemical processes, then granulated and mixed together. According to Agriculture and Rural Development of Alberta, Canada, farmers choose chemical fertilizers for their quick absorption and because they are specially formulated for the plants that they grow. These tiny, raw granules of nutrients swiftly dissolve into the soil and are readily available for plants to soak up, unlike organic fertilizer, which has all kinds of other materials that must break down before the plants can absorb them. A complete fertilizer contains nitrogen, phosphorus and potassium. There are different ratios available, but all complete fertilizers contain these three nutrients. Plants need nitrogen for green, leafy growth; phosphorous for fruit and strong roots; and potassium for bigger flowers and overall strength. There are also chemical fertilizers packaged for specific plants. For example, azaleas prefer acidic soil, and so a specially formulated acidic ratio of fertilizer helps them grow. Plants, however, don’t know the difference between organic and inorganic fertilizers--they simply soak up nutrients out of the soil, and once organic fertilizer decomposes it looks exactly the same to a plant. Unlike chemical fertilizer, organic fertilizer is made of anything that was once alive and contains lots of extra material such as composted plant fibers and minerals, making the nutrients less concentrated. Plants absorb nutrients continuously, so there is danger of overdosing plants with a nutrient when using chemical fertilizer. A slow-release chemical fertilizer is available that mimics organic fertilizer by dissolving and decomposing slowly. Chemical fertilizer works fast, costs less and is readily available in large quantities. One drawback is that it can "burn" plants, which means the chemicals dry out the plant tissue. Part of the plant may turn brown, or the whole plant might die. The other issue is that nitrogen can leach out of the soil during irrigation--nitrogen is so water-soluble that it drains out of the soil and into groundwater and other water. Not only would the plants not really be getting the nutrient they need, the leached nitrogen can cause serious health problems and birth defects in animals and humans using the water. According to the University of Arizona Cooperative Extension, organic fertilizers are less likely to burn plants, they decompose slowly and therefore won’t over-fertilize plants and they contain other materials that benefit the overall health of the soil. Organic fertilizer is made chiefly of manure from farms, where it has to be collected and composted,, and there simply isn’t enough of it available to satisfy the demand. There is also no way to know exactly what nutrients organic fertilizer has because it has not been measured and formulated in a lab. Farmers have to be more careful with the amount of chemical fertilizer they apply, but it is easy to calculate how much they need. The farmer can perform a simple soil test to find out what nutrients are lacking, and then complete a simple formula to see how much fertilizer to add to the soil. They can spray chemical fertilizer over the top of the ground evenly, burying it in the ground near seeds, or apply it dry where it will soak in when watered. The ease of use and variety of application methods are more convenient than those of organic fertilizer, which must be spread over the ground and then mixed into the soil either manually or with machinery. For most farmers, the benefits of chemical fertilizer comes down to economics. Most farmers do not use exclusively organic or inorganic fertilizer, but rather use them together. According to the University of Florida, farmers reported that using both types together results in higher crop yields. Since there is not enough manure for all farmers to have enough to fertilize their soil, and chemical fertilizer is less expensive, farmers make more money using chemical fertilizers than they would otherwise. Farmers who use chemical fertilizer must be wary of applying it too heavily. Nutrients can build up toxic concentrations of salts and create a chemical imbalance if added too frequently or in the wrong amounts. Without careful management, the soil can become depleted of all nutrients, and valuable topsoil could be lost since these fertilizers don’t add any biological material to the soil. When used in moderation, however, following the manufacturers guidelines, chemical fertilizers are an inexpensive and convenient way to guarantee plants are getting the right nutrients for an optimum yield. Agric.gov.ab.ca: “Agri-Facts:” Alberta Fertilizer Guide; June 2004 . Ag.arizona.edu: “Master Gardener Manual Reference;” Soils and Fertilizers: Fertilizers. 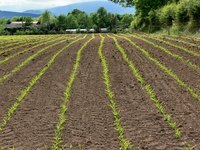 p2pays.org: “Energy Efficiency & Environmental News;” The Energy and Economics of Fertilizers; Florida Energy Extension Service & Helen Helikson.